At the peak of the Maya civilization between 250 and 900 AD, residents of the empire had developed complex mathematics, architecture, and sprawling cities. We now know that the Maya may have developed even more advanced networks. Last month, scientists surveyed a Mayan ‘megalopolis’ in present-day Guatemala made up of 60,000 structures. Anthropologist Heather McKillop, who was not a part of the study, is adding to that story. She uncovered clues of a vast Mayan salt production system off the coast of Belize that may have been used to preserve fish and a place for trade. Her findings were published this week in The Proceedings of the National Academies of Sciences. McKillop tells us how the Maya may have produced salt, and what this reveals about the economy of the civilization. 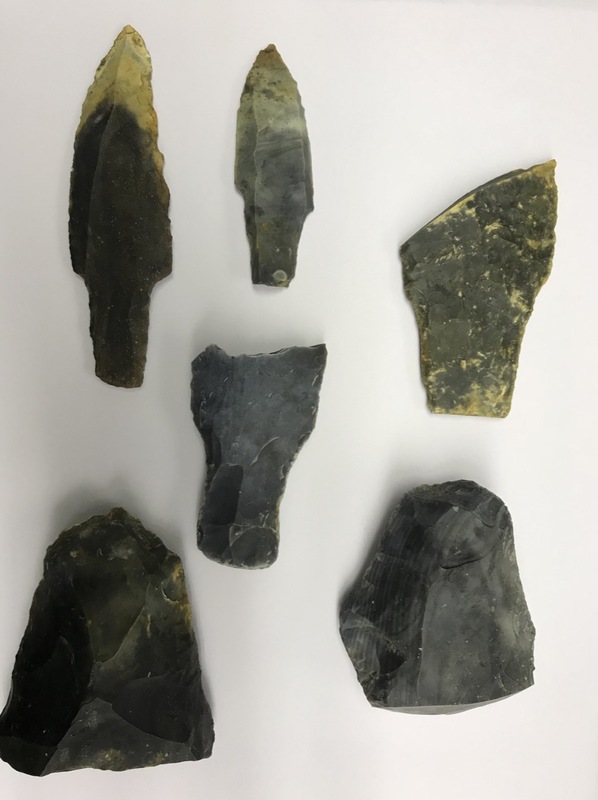 Read the full study about the use-wear examination of the stone tools. Learn more about the discovery of the Maya “megalopolis” detected by Lidar technology. Heather McKillop is a professor of geography and anthropology at Louisiana State University in Baton Rouge, Louisiana. IRA FLATOW: This is Science Friday. I’m Ira Flatow, broadcasting today from the studios of KCLU, on the of California Lutheran University in Thousand Oaks, California. Later in the hour, a primatologist takes us into the world of South America’s squirrel monkeys and what they teach us about our own evolution. But first, the Maya invented a sophisticated mathematics system that included the number zero. Yeah, zero had to be invented. They used this in their calendars and astronomical studies. They also had farming systems and a complex political structure to govern the sprawling city networks. It was a complicated place. And the full story is getting even more complex. Last month, scientists surveyed a Mayan megacity in Guatemala that had over 60,000 structures. And this week, researchers say that the Maya may have also had a salt industry on the coast of present day Belize. These results were published in the Proceedings of the National Academies of Science. Here to tell us about the Mayan salt economy is Heather McKillop. She’s an author on that study and professor of anthropology at Louisiana State University in Baton Rouge. Welcome to Science Friday. HEATHER MCKILLOP: Thank you. It’s great pleasure to be here. IRA FLATOW: It’s our great pleasure to have you. Thank you. You can make salt in a variety of ways, so what technique do the Mayans– what were they using to make salt? HEATHER MCKILLOP: Well, like people around the world– of course everybody need dietary salt in ancient civilizations and other farming cultures as well, but the Maya collected salt from salt flats off the north coast of the Yucatan. But in other areas, like the coast of Belize where it rains a lot and they don’t have the solar evaporation possibilities, they were boiling brine in pots over fires. And we found in southern Belize, below the sea floor, we found wooden buildings which indicate they were doing this salt production indoors on a massive scale. IRA FLATOW: Was this surprising and unexpected? HEATHER MCKILLOP: Yes, it was. I was really doing a regional survey, looking for a site after having worked elsewhere on the coast. And I was looking in shallow areas in the water because we’d identified sea level rise. And we found sites that were about a meter below the sea floor. And we excavated them and they had pottery that I identified as salt-making pottery. I even published a book on the find– Salt– White Gold of the Ancient Maya. But in 2004, we made a major discovery. And that was that below the sea floor, it’s mangrove peat, and the peat, which is resulting from sea level rise, it preserved wooden posts. And now we’ve mapped over 4,000– we’ve actually mapped 4,042 wooden posts and other architectural elements at 110 sites where there are wooden buildings that are associated with this salt-making material. And the significance, I guess, is that wood normally decays in the tropical landscape of Central America. And I’d already written a lot, done a lot of research about these salt-making sites, and we actually didn’t see the wood at all until 2004. IRA FLATOW: So how would the wood have been used in the salt production? HEATHER MCKILLOP: Well, instead of being an activity that might have taken place outdoors– boiling some salt– the wood formed rectangular outlines of buildings. And so these buildings I identify as “salt kitchens” by comparison with modern and historic salt making in the Maya area today and elsewhere around the world. So this was an infrastructure where they would get maybe a couple of dozen bowls over a fire at once and continuously work on evaporating the brine by fire. They would store their firewood. They would store their salt cakes. They would store the wet salt and brine and really dedicate the space inside buildings to salt making. IRA FLATOW: So I see you found a whole salt production technique– a whole salt production line, and they were very serious about this. HEATHER MCKILLOP: They were really serious about it, because all those big Maya sites that you talked about and the new discoveries from the lidar– people still need dietary salt. Biologically, they need it. And they didn’t have it. HEATHER MCKILLOP: Yes. That was unexpected. IRA FLATOW: –we’ve heard about in Western cultures. HEATHER MCKILLOP: Exactly. So the peat– mangrove peat below the sea floor perfectly preserved wood, but it did not preserve bone. And because of all the posts that we found in these wooden buildings, I figured that the stone tools, the chert stone tools, were used for chopping down trees and sharpening the posts and other woodworking things that they were making, like paddles and canoes. So when I contacted my colleague Kazuo Aoyama, who is an expert on studying the microscopic damage to the edges of stone tools and I asked him if he would collaborate on this project, he did and he found that a minority of the stone tools were actually used for woodworking, and most were used for cutting fish or meat or first scraping hides or scaling fish. So that really changed things for us. IRA FLATOW: So you found that they were using salt for a lot more things than had been suspected before. HEATHER MCKILLOP: Yeah, I thought– so previously, I had built up this story, based on I think some good, solid evidence, that they were producing a tremendous amount of salt and they were probably storing it and trading it in the form of salt cakes in standardized units based on the standardized dimensions of the pottery vessels and they were taking salt as a commodity to markets up rivers to inland cities to trade at marketplaces. And so the discovery of the fish adds to the story by saying, well, yes I think they were also taking salted fish. And both of these are storable commodities that really are a good risk management strategy for a household economy, and also for whoever buys the things at the inland market. You don’t have to use it right away. You can hold onto it for a while. IRA FLATOW: That’s amazing. I mentioned that the lidar survey had found 60,000 structures in Guatemala. What is this revealing about the complexity of this civilization? HEATHER MCKILLOP: Well, like you said, the Maya had the concept of zero. They probably used that– did complex calculations in their marketplaces as well as the calendar. And they had a very dense and large population of cities, towns, and villages. Where we are, on the southern coast of Belize, everything has been submerged by sea level rise and covered in mangrove, but in the interior, in the rainforest, there’s a surprising number of sites. I think the lidar has really transformed our ability to look at sites in a whole different way– first of all, to see them before you start excavating and make a plan. But the density of population is really impressive. IRA FLATOW: Is there enough resources, people power– anything– equipment– enough to go in and see these 60,000 different structures and the vast expanse of this civilization? I mean, are you able to do that? HEATHER MCKILLOP: Well, I think that, fortunately, for my sites, they’re all under water and you can’t see them and they’re below the sea floor and it’s really hard to see anything at all. You really have to know what you’re looking for, and know I know where they are. We also have GPS to help us find them. And these sites are still protected in the rainforest. So even though they’re visible on lidar, unless you have access to the lidar data, you can’t really see these sites and it’s still very difficult to get to them. But I think in terms of the archaeological projects that work on the interior of Guatemala now, they’ll be able to plan their research because they’ll be able to see these things on lidar and make plans before they go in the field, which is like working in the desert. IRA FLATOW: Yeah. You know, it’s interesting. I have a couple of questions for you. One is, the discovery of this all the salt making– does it change your ideas about the economy of the Maya? I mean, were using this as money, using it for trade? All the salt that there were mass producing. HEATHER MCKILLOP: Yes, I think what it really does is underscore the fact that the Classic Maya had a marketplace economy, and it was largely a lot of trade in regional economy. So they had various different kinds of exchange and acquired things from short distance and long distance. But I think it was based on the household economy, sort of a family business– in this case, making salt and making them in standardized shapes and sizes. So the example I looked at three different sites of our Paynes Creek Salt Works– three different areas. And they were making– their pots were different in their dimensions– slightly different. And these were statistically significant differences, suggesting to me that they made their own pots and they made the salt, and they were doing it as part of a household economy. And now we know that they were taking the salt cakes– standardized units of exchange and storage– and also the salted fish– taking them to inland sites, and they were trading them. The Maya of course, didn’t have a currency per se, but they did have currency equivalencies. And I think salt cakes can be discussed as a currency equivalency. IRA FLATOW: How much of this can be actually reconstructed? You say a lot of it was under water– you know, the sea level rise. I understand you found a wooden canoe panel? HEATHER MCKILLOP: –a canoe as well. And so that’s sort of the infrastructure of distribution. IRA FLATOW: Well, I want to thank you very much, Dr. McKillop, for taking time to be with us today. HEATHER MCKILLOP: Well, come down and swim with us sometime and see for yourself. Thank you very much. IRA FLATOW: I’m putting it on my list. Heather McKillop, author of a study that was published in the Proceedings of the National Academies, professor of anthropology at Louisiana State University in Baton Rouge. We’re going to take a break and come back and talk about the secret lives of squirrel monkeys. Didn’t know they had a secret life. We’re uncovering it here. You want to know the details? Stay with us. We’ll be right back after this break. Two archaeologists weigh in on what the ancient Maya actually said about 2012. Spoiler: not much.